In a sauce pan heat 1tsp of olive oil, add the garlic and stir until lightly brown, add the passata, hoisin sauce, basil and balsamic vinegar, then season to taste. Let it simmer for 5 minutes and leave to stand at room temperature while you get on with shaping the base. When the dough is ready, roll it over until you have a 28cm circle approximately. Spread half the sauce over, almost up to the edge. 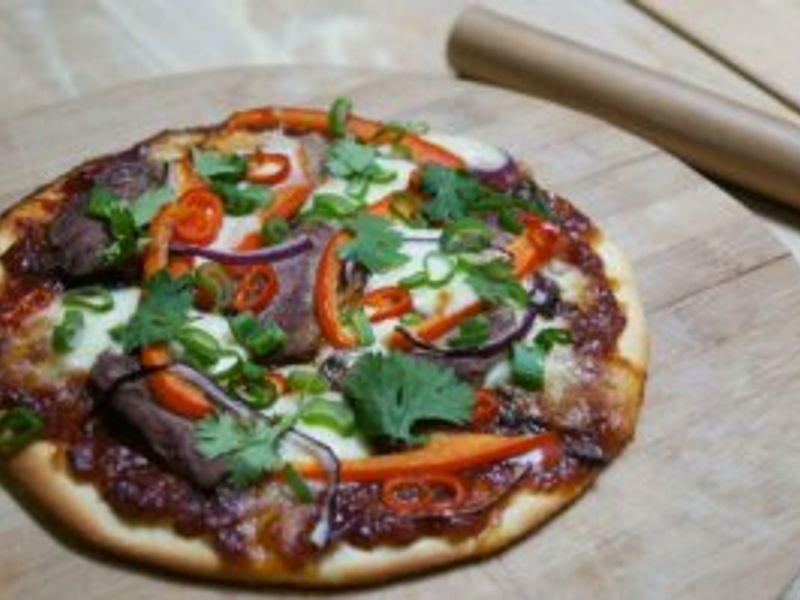 Top the pizza with the red pepper, red onions, the sliced duck breast and the mozzarella. Bake for 12-15 mins, until the topping is bubbling and the dough is going brown. Once out of the oven, sprinkle the coriander. Repeat with the remaining dough and toppings. And there you have it, Pizza with an Asian twist. As always, we want to see what you are up to! Share your creations with us on Facebook, twitter and Instagram .